I construct knives for my pleasure and the pleasure of those who will possess them. I love life outdoors - Bow Hunting, fishing and the mountains. I have practiced mountain climbing for twenty years and mountaineering skiing. In the beginning I enjoyed this with my wife Marilena. With the arrival of my sons we enjoy many things together as a family. When my sons wanted to find employment not far from home it was an easy step for them. I am proud to say my sons Nicolo and Francesca are knifemakers also. I am by profession a carpenter and have completed art studies. This experience I transfer to my blades. I sold my first knife in 1995. 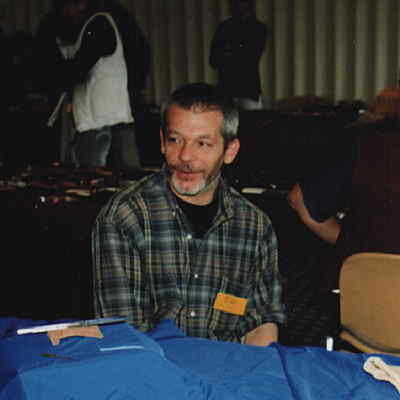 In 1997 I was admitted to the CORPORAZIONE ITALIANA COLTELLINAI (The Italian Knifemakers Guild). In May of 1999. I achieved MASTER status. I primarily use the stock removal method for my blades. I use ATS-34, RWL34 and commercial Damascus. The value of my knives comes from the working of the knives and the materials I use. I like to work with a variety of materials. I like to try several different designs. I have made swords, katanas and Persians. I prefer making integrals to make interesting handles and use many different materials. I look at a piece of steel and try to imagine the blade that will come from it. I prefer to make custom orders.